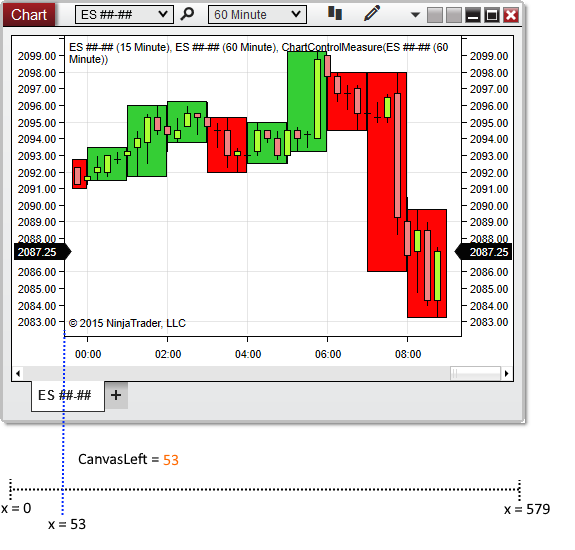 Indicates the x-coordinate (in pixels) of the beginning of the chart canvas area. A double representing the beginning of the chart canvas area. Based on the image below, CanvasLeft reveals that the chart canvas area begins at x-coordinate 53. Note: When no data series are left-aligned on a chart, CanvasLeft will return 0, representing the x-coordinate origin, because the chart canvas will begin at coordinate 0.